Chelsea left-back Marcos Alonso has been slammed for his role in Manchester City’s first goal in their Premier League clash yesterday. In case you somehow missed it, City thrashed Chelsea 6-0 – and, worst of all, it arguably flattered the visitors. Alonso had a real shocker on the first Raheem Sterling goal, as shown in this video clip below. 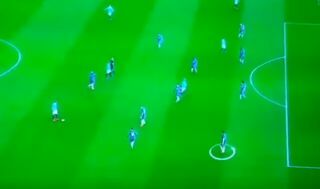 The Spaniard for some reason drifts centrally, leaving acres of space for Bernardo Silva on the right flank, which leads to his ball eventually finding its way to Sterling for an easy finish. Unsurprisingly, these Chelsea fans were furious with Alonso, who isn’t exactly Mr Popular at Stamford Bridge these days anyway. This just sums up Alonso ? 3 minutes into the game and #MarcosAlonso is already out of position that led to the first goal, how do someone even tries to defend his performances when he himself cannot defend……. Marcos Alonso, No comment ???? ?